This past summer we worked closely with one of the foster homes on the island, New Start Foster Home, home to 22 foster kids coming from various backgrounds. Our aim was to provide the kids with a safe and fun environment during the summer. Over the summer the children participated in a variety of activities. The summer activities started with 11 children participating in a basketball camp organised by Island Hoops. The children were able to learn and enjoy the game of basketball with their peers and make new friends. They learned to dribble, pass and shoot, and also learned life skills. 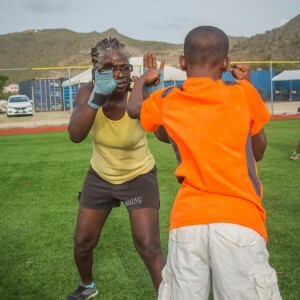 Over the course of the summer, the children also got to learn about boxing. The boys and girls learned the basics steps of boxing and found it interesting. Volunteers had a good time teaching the children and seeing them progress during the class. We continued to keep the children active and they enjoyed a day bike-riding on the boardwalk in Philipsburg. It allowed them to feel free and enjoy the scenery and fresh air. 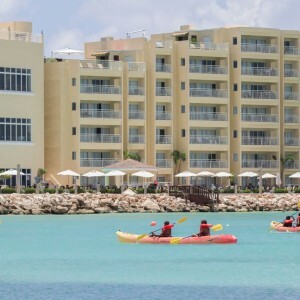 Besides activities on land, the children got to enjoy the beach with a sponsored kayaking activity by Tri-Sport. They learned how to work together to move the kayak in the right direction and enjoyed taking turns with different partners up and down the beach. It was the first time for some and they really enjoyed it. The children, many who were very young, got a chance to have a baseball introduction session. Many of the children didn’t know the rules of baseball so it was a fun learning experience for both children and volunteers. 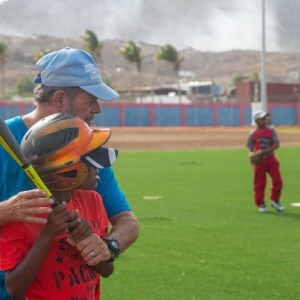 With the help of a coach and volunteers, the children learned how to hold a bat, bat the ball, run to the bases, catch and so much more. It was an interactive day that everyone enjoyed. The sport activities were a big hit but we wanted to also have them learn during the summer. We visited a local community garden, Spaceless Gardens, where 12 children learned about local fruits, eating healthy, agriculture, gardening and how to become sustainable. They toured the grounds and at the end received Johnny cakes and homemade juice. 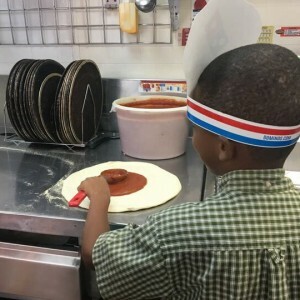 Domino’s Pizza was contacted for a fun tour and 11 children were welcomed by owner Mr. John Caputo, who personally taught the children how to make their famous pizza. The children were split into groups of 4 and got to make their own pizza, placing the sauce, cheese and favorite toppings. The children enjoyed their pizza and got a chance to color and got certificates for participation. As one of the last activities for the summer, we brought the activity to the New Start Foster home. 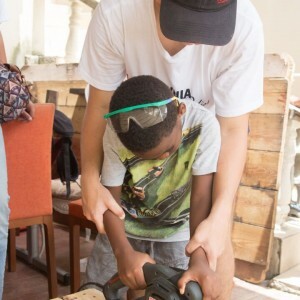 The activity consisted of repurposing wooden pallets into a bird house for the home and a basketball backboard for the children to play basketball in the back yard. The volunteers led the activity while the children helped measure the pieces to be cut, used the sander to sand the wood, painted the lines for the backboard, put the rim on the backboard and helped put the backboard up. The children at the home can now play basketball after homework and during the weekends which improves their home life. We were happy to see the smiles on their faces during all the summer activities and look forward to seeing more smiles and laughs throughout the many other activities throughout the rest of the year.